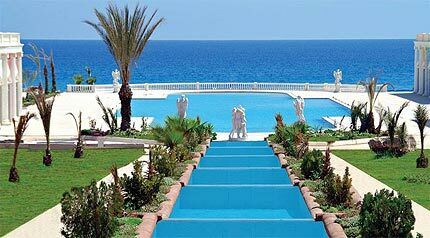 Kaya Artemis Resort Hotel is located in Bafra, Northern Cyprus. One of the great wonders of the world was the ancient Temple of Artemis at Ephesus – and you might say the new Kaya Artemis Resort Hotel in North Cyprus is pretty much of a modern day wonder too! The Kaya Artemis Resort Hotel bring long-overdue five star accommodation to the east coast of North Cyprus (Bafra), and not since the Romans times has the Famagusta region seen anything quite like it! 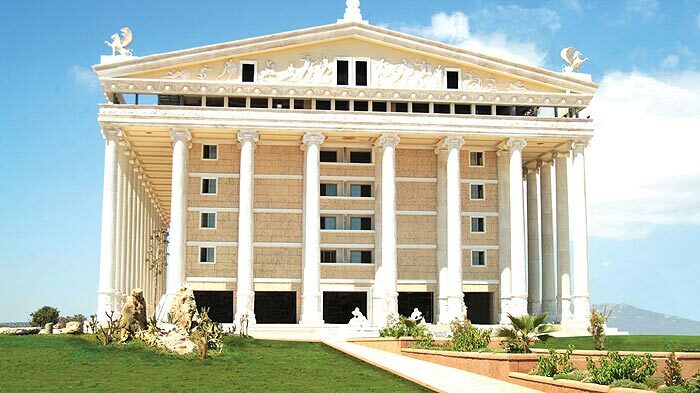 The front of the hotel is a reproduction of the temple at Ephesus, complete with columns and statues, but on a larger scale, and the effect is of a modern hotel dropped into the middle of the Parthenon. The resort provides a massive 2,500 bed capacity, a casino, shopping centre, swimming pools, spa, conference centre and meeting rooms, all of which are a far cry from the quiet and private sanctuary provided by the goddess Artemis in Ephesus! The Kaya Artemis Resort Hotel facilities bring a whole new standard of upmarket accommodation to North Cyprus. The 726 standard hotel rooms and upmarket suites offer everything you would expect in a top European hotel, from satellite tv and wireless internet to complimentary bathrobe and slippers. 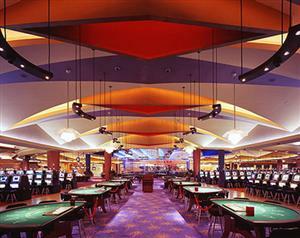 At the heart of the Artemis Resort Hotel in North Cyprus is the Casino, but there is plenty to occupy guests when they are not playing the roulette wheels or the blackjack tables. The private beach at the Kaya Artemis Resort Hotel is ideal for lazy days, with towels, parasols, deck chairs showers and even fans provided for hotel guests to enjoy the sand and the sea all day long. Not that you need to stray outside the Kaya Artemis Resort Hotel grounds to enjoy a cool swim, as the resort has two outdoor and two indoor pools, plus two separate children’s swimming pools. For total relaxation, head for the Kaya Artemis Resort Hotel Spa, where you can pamper yourself in a whole world of water experiences, including the special sound and light pool sauna, massage, solarium, steam room, snow room, two Turkish Baths, and a whirlpool bath! In addition, the Kaya Artemis Resort Hotel health and beauty centre offer a variety of treatments. Active types will love the range of sports facilities on offer at the Kaya Artemis Resort Hotel, including tennis courts, sailing, bowling, archery, squash and even billiards. Watersports on offer include jet skis, sailing, canoeing and scuba diving in the clear waters of the Mediterranean. In front of the hotel is the long sandy beach of Bafra. The resort is also very proud of its lush green grass football pitches comprising of two standard fields and two training fields. Kids will love the Kaya Artemis Resort Hotel too, even if the classical architecture literally goes over their heads. They’ll be able to join the Mini Club (ages 2-7) and Teen Club (ages 12-16) events, which range from outdoor sports such as volleyball and water-skiing to organised activities in the Agora area of the complex. They can also enjoy movies in the 800-seat cinema, take parting art workshops and even try their luck in the bowling alley. When hunger strikes, the whole family can enjoy a rang of dining at the Kaya Artemis Resort Hotel, either in the Main Restaurant that seats an impressive 1500 people, the Roof Restaurant seating 300, or one of the three a la carte restaurants serving Italian, Chinese and Turkish-Ottoman menus. There are also snack bars and even a pub where you can fine good food all day (and night). The casino at the Kaya Artemis Resort covers an impressive 3500 square metres, and features a VIP saloon, café, restaurant, safe boxes and every feature you would expect to find in a top Las Vegas casino. The developer Burak Kaya has a very definite market in mind, and he is also quite determined that his new venture will success. "My main target is Israeli tourists. They usually do not trust the casinos in Cyprus. Last month we received an offer from a tourism agency in Israel. They said they want to send 40,000 Israelis in the summer of 2007. We made all of the necessary agreements and deals. Just when we thought everything was going perfect, the Greeks ruined our plans by saying 'We do not allow you to use our airport for your international guests.' Now, we are planning to bring Israeli tourists via the Antalya Airport." This web page is served on 18 April 2019 at 22:07:28.